Our well-reckoned entity is rigorously engaged in supplying and exporting Armod Tablets. We carry out our operations from Maharashtra, India. Our vendors manufacture them with the utmost precision, by using the optimal grade chemical compounds and advanced techniques. These are profusely demanded by the leading hospitals and pharmaceutical stores, all over the world. Armod 150 mg contains Armodafinil 150 mg.
Armod 150 mg is available in the blister pack of 1 X 10 Tablets. 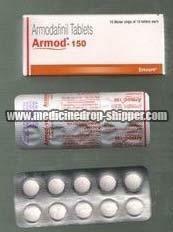 Armod 150 mg is Brand from the Emcure Company.